Tomorrow, April 6th, would mark the 193rd birthday of Felix Nadar. Nadar, aeronautical scientist and photographer, became an unexpected star of the Smithsonian Libraries’ Dibner Portrait collection in The Commons on Flickr. Although probably not a household name these days (and definitely not under his given name – Gaspard-Félix Tournachon), Nadar was quite a character in 19th century France. Luminaries of all kinds, including George Sand and Marcel Proust, flocked to his Paris photography studio for portrait sittings. He was also a regular contributor to several French comic papers. While experimenting with balloons, Nadar took the first aerial photo from one in 1858. His adventures with ballooning are said to have inspired Jules Verne’s book Five Weeks in a Balloon. 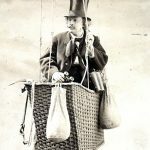 Nadar later turned his attention to heavier aircraft, such as the helicopter, and in his 1910 New York Times obituary, Nadar was credited as having conceived of the idea of a “heavier-than-air flying machine” years before the first successful “aeroplane”. 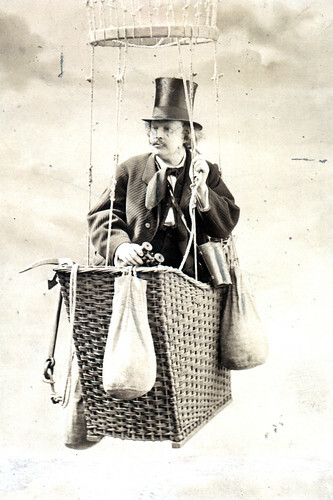 This unusual portrait, showing Nadar aboard one of his balloons, has been featured in the online exhibit Scientific Identity: Portraits from the Dibner Library of Science and Technology for more than eight years, but it wasn’t until Nadar made his debut on Flickr that he gained internet popularity. He is now a favorite of more than 400 people and featured in such unusual Flickr pools as “Basket World”. A colorful figure of the 19th century finding a new fanbase in the 21st! Next Post Check out the BHL’s new user interface! I have never heard of him, or rather I don’t remember hearing the name, though I’m sure I’ve had to have heard who had captured the first aerial photo at some point. Despite the fact that working with rope in both climbing and rope rescue has taught me that looks can be deceiving and things are usually much more secure than they appear. Even so but that basket , suspended d by those ropes doesn’t look like my idea of a grand old time if floating about in a balloon.